As I populate my blog with more and more recipes you will notice that chicken stock will show up in the ingredients over and over again. Indeed, I use chicken stock in a ton of different ways and find it to be an invaluable ingredient especially in healthful cooking. Aside from the obvious soups, risottos, and sauces I use chicken stock in place of water nearly every time I cook rice or couscous. Adding a little chicken stock to simmered beans adds body and richness, especially if you are going to make a puree. And, don’t forget those veggies either! A little stock boosts the flavor of blanched then sautéed vegetables nearly as well as a pat of butter and with much less fat. Inasmuch as I tout the glories of chicken stock, I cannot emphasize enough how much better it tastes if you take the time to make your own! While I will at times use a canned chicken “broth”, there is simply nothing better than homemade. I say “broth” because I have yet to find a commercial stock that comes even close to the goodness of homemade. If I must used canned broth, I nearly always go with my favorite, Swanson’s Certified Organic Chicken Broth . For flavor, sodium level, and value, most others pale in comparison. So what is the difference between stock and broth? To put it simply, stock utilizes more bones than meat in its preparation and nearly always involves browning of the ingredients before simmering. Broth on the other hand uses more meat than bones and generally involves no browning of the ingredients before simmering. Stock is typically cooked longer than broth and usually contains less salt. While the two are entirely interchangeable, stock is essentially a richer more flavorful version of broth which is why it is preferred in sauce-making while broth is used more often in soups. Because I always seek to maximize flavor in my cooking, I nearly always use stock. What is my secret to a good pot of chicken stock? Store-bought Rotisserie Chicken no less! Out of habit, I freeze all of our chicken scraps stashed in a zip lock bag and when I have enough saved up, I make stock. While I have long browned my chicken parts before making stock, when I started buying Rotisserie Chickens from Costco for quick dinners on busy nights, I noticed an immediate improvement in the richness of my stock. Maybe it is the browning the rotisserie imparts on these chickens or maybe it is the marinade they use. Whatever the case the difference is remarkable enough that before I make a pot of stock I always wait until at least half of my stash of ingredients is from these chickens. To add additional flavor I also freeze any fresh herbs or vegetables (IE: onions, garlic cloves, apples, etc…) that were originally cooked with a home cooked chicken. Brown these right along with your chicken and you would be amazed how much flavor they can bring to the party! 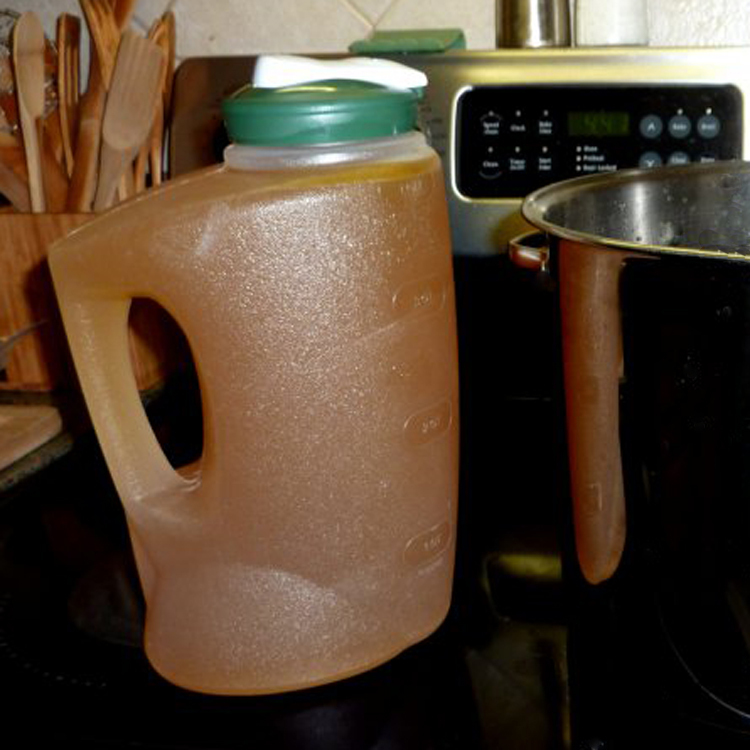 When I make a batch of chicken stock, for convenience alone, I keep a quart or so in the fridge for up to a week. The rest I freeze in usable batches of 2 cup and ½ cup measures. For the former I pour two cups of cooled stock into a 1 quart Zip Lock Freezer bag, squeeze out the excess air, seal and stack them in the freezer. For an approximate ½ cup portion I pour the cooled stock evenly into a silicone muffin pan, cover loosely with stretch wrap, and freeze. The next day I pop the frozen portions out and store them neatly in another Zip Lock Freezer Bag. An ice tray does the same trick for even smaller portions but I don’t usually bother. I am a big stickler for fresh foods and perhaps it is because I go through it so fast but I really haven’t noticed a difference between fresh or frozen homemade stock. Pour the hot stock in to smaller and/or flatter containers to cool. Set your stock pot into a sink or tub of ice water or even cold water, refreshing the water a time or two as it gets warm. Freeze water a day or two ahead of time in a sanitized an empty ½ gallon milk container. Gently place the frozen container into your stock. Fill a gallon sized Zip Lock Bag with ice cubes. Gently lower this into your “warm”stock. Google “food safety” if you have any doubts and always use care in your handling of any food. 1 – One gallon Zip Lock Bag stuffed full of chicken necks, wing tips, and carcasses, thawed. Fresh water to cover all by 1 inch. Kosher salt & fresh ground black pepper to taste. Meanwhile, coat the bottom of a large stock pot with a spray of olive oil and cook the remaining ingredients over medium-low heat, stirring occasionally, to release flavor. When the chicken is cool enough to handle, add all of it including any collected juices, to the stock pot. Carefully swirl a small amount of fresh water in the cookie sheet to dissolve any browned bits and add this to the stock pot. Pour in enough fresh water to cover all ingredients by about 1 inch. Increase heat to high and monitor closely until nearly boiling, skimming off any excess foam. When the liquid reaches a near mild boil reduce the heat to simmer and cook 3 to 4 hours checking from time to time to keep from reaching a full boil. After 3 – 4 hours remove the stock pot from heat and allow to cool somewhat before straining. When the stock has cooled enough to handle, using a slotted spoon, remove the largest solids to a colander or sieve set in a bowl to capture any draining stock. When most of the solids have been removed, strain remaining stock through cheesecloth or a sanitized dish cloth to clarify. Skim any remaining fat as it accumulates at the surface and/or remove any fat accumulations after the stock had been refrigerated. Several friends have asked me to share some of my “Clean Eating” recipes as Kat and I have been trying to eat better foods on a regular basis. Some are new to cooking so I thought it would be helpful to include the recipes for the entire menu including each step in the preparation. So here is a super quick, healthy, yet tasty menu that’s easy enough to throw together on a weeknight. I would love to hear some feedback on how you like the recipe written in this fashion. If you like them I will include more “menu” posts as my blog continues. 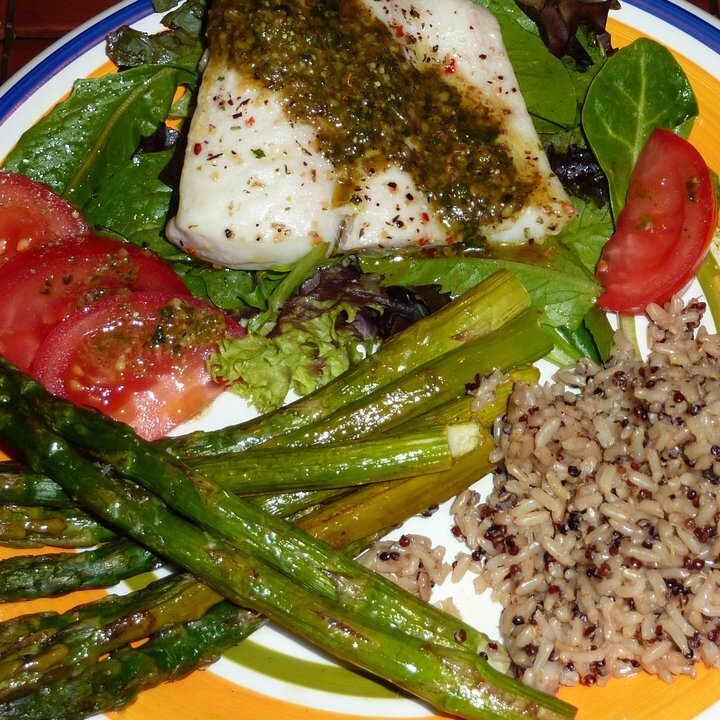 Fresh fillets of halibut (pictured), corvina, grouper, or tilapia if you must, sliced into 4 to 6 oz portions. 1 light sprinkle per serving – mixed dried Italian herbs in a grinder (I used McCormick’s). 1 Tablespoon per serving – jarred basil pesto (I used Kirkland brand from Costco). About 1 Cup per serving Quinoa and Whole Grain Brown Rice. 1. Preheat the oven to 400 degrees. clean, rinse, and pat the asparagus dry. In a small bowl, whisk the vinegar and oil until slightly thickened. On a foil covered cookie sheet gently roll the spears in a single layer while drizzling with just enough of the oil to coat. Place in the heated oven for 15 minutes. 2. While the asparagus is in the oven place the fish on another foil covered cookie sheet and roll each piece while drizzling with about 1 Tablespoon of olive oil. With the fish skin side down, lightly sprinkle each piece with the spice grinder. Set aside until the asparagus comes out of the oven. 4. After 15 minutes, carefully remove the asparagus from the oven and turn the broiler on high. Grate a little Parmesan and black pepper lightly and evenly over the spears. 5. Allow the broiler to heat up for at least a minute or so then place the fish in the broiler and close. Broil the fish for 4 minutes per inch of thickness…3 minutes if it’s 1/2 inch or less. 6. While the fish is cooking nuke the quinoa and prep your plates with about 1 cup each of the dressed greens and a carefully placed serving of the Asparagus. Add fresh tomatoes if you like! 7. 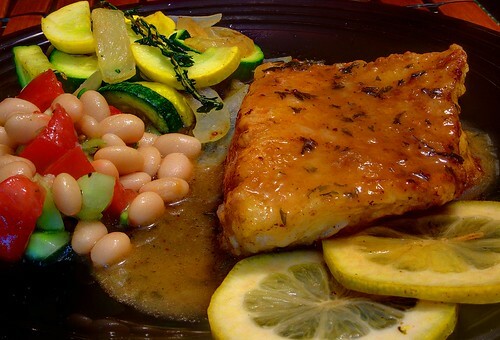 Remove the fish from the oven and carefully place each serving on top of the greens. “paint” each piece with about 1 Tablespoon of the prepared pesto. 8. Finish the plate with an approx. 1 cup serving of the quinoa and…. Viola! It’s time to eat.